assessON makes it easy to evaluate and track Mathematics and Science students’ readiness for learning, their progress as they learn, and their levels of achievement. Jump to section: Features | Why use assessON? | What are teachers saying? | FAQ | How to buy? Track students’ progress FOR, AS and OF learning. 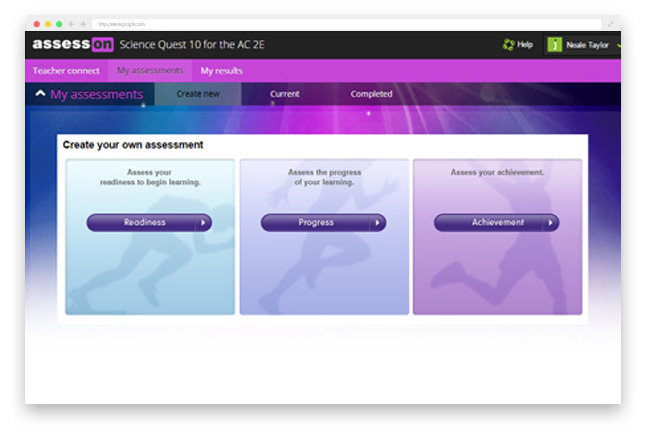 assessON is an interactive online assessment tool for Years 7-10 Mathematics and Science. Students can complete and submit tests, homework tasks and practice exams, and even prepare for NAPLAN in Year 7 and 9. 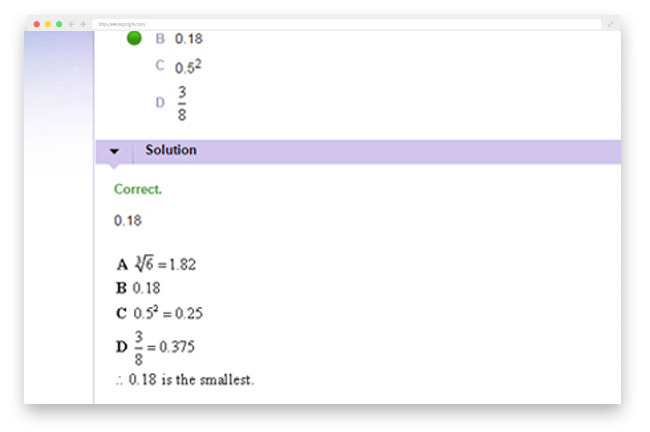 Auto-marked questions and worked solutions provide instant feedback. 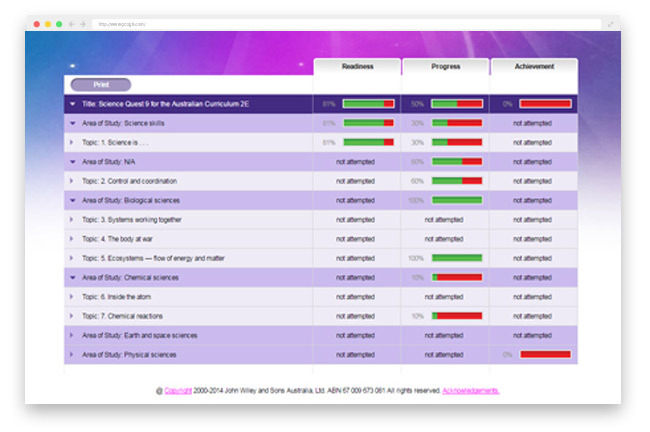 Aligned with the Jacaranda Maths Quest and Science Quest series, teachers can choose to incorporate assessON as part of their classroom practice and/or let students use it independently for extra revision and practice. assessON Teacher Edition enables teachers to assign activities for students to complete, schedule tasks that are automatically marked and recorded, and track progress at an individual, group and classroom level. Together, assessON and the Jacaranda Maths Quest or Science Quest series provide a complete teaching solution for Years 7-10.
assessON supports assessments FOR, AS and OF learning and includes a wealth of assessment materials prepared by experienced teachers. For Mathematics, questions are provided across the required proficiency strands: Fluency, Understanding, Problem-Solving and Reasoning. 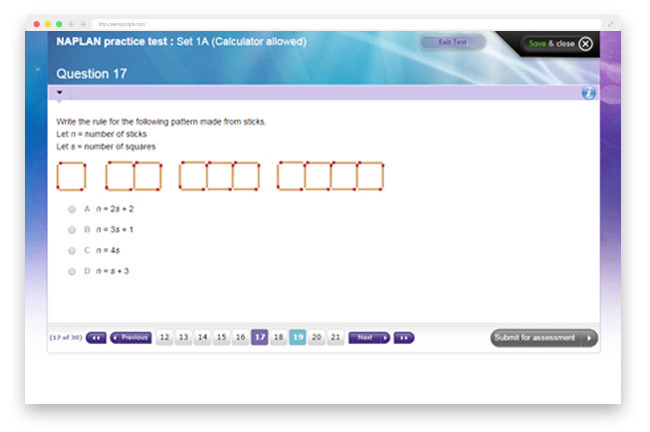 Teachers using Maths Quest 7 and Maths Quest 9 can access online NAPLAN numeracy practice tests to help students prepare for this crucial test. Automatic marking provides instant feedback and saves teachers time. With assessON Teacher Edition, teachers can create classes and custom groups based on different skill levels to facilitate differentiation. What’s more, reports of students’ activities and results are available at the individual, group and classroom level against national curriculum requirements. This enables teachers to identify individual strengths and weaknesses and intervene at the right time. As an interactive assessment tool, teachers can choose to create and assign online assessments, and/or let students use assessON on their own for extra revision and practice. The ability for students to create their own assessments and homework tasks, and receive instant feedback, inspires student independence and accountability for learning. 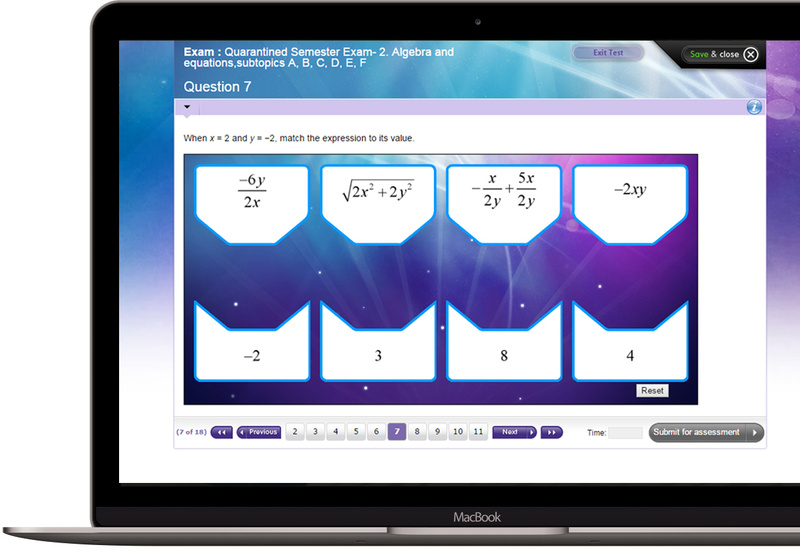 assessON is aligned with the Maths Quest and Science Quest series so teachers don’t waste time finding relevant questions for assessments, homework or NAPLAN practice tests. Auto-marked questions and worked solutions not only help prevent the creation of misconceptions, but save teachers marking time. What are teachers saying about assessON? Does the Teacher Edition come with access to assessON that students use? Yes. assessON Teacher Edition includes access to assessON Student Edition. Is assessON linked to the relevant Jacaranda resource? Yes. assessON is aligned to the Maths Quest and Science Quest series to provide a complete solution. Is assessON linked to the curriculum? Yes. Similar to the Maths Quest and Science Quest series, assessON covers key skills and concepts from the curriculum, including the four proficiency strands for Mathematics (Understanding, Fluency, Problem-Solving and Reasoning). assessON is suitable for use in all states across Australia. Is assessON compatible with the iPad? What are the system requirements for using assessON? assessON is available as a standalone purchase, as part of a value pack (combined with the Maths Quest or Science Quest text) or as part of the Jacaranda Bundle plus (a package of 10+ premium digital resources) to suit the needs of all schools and individual parents. assessON is included in the Jacaranda Bundle plus for the Australian Curriculum, Victorian Curriculum and Western Australian Curriculum only. Value pack pricing from $54.95 Not available as an individual online purchase. Institutional license only for the Australian Curriculum, Victorian Curriculum and Western Australian Curriculum. Institutional license Contact your Jacaranda Sales Consultant for more information. Bundle pricing from $110 per student. Experience unmatched value for money with the Jacaranda Bundle plus: 24/7 access to 10+ high quality digital resources across core subjects, including assessON, at a fraction of the cost of individual purchases. *Jacaranda Bundle plus shown is for the Victorian Curriculum.